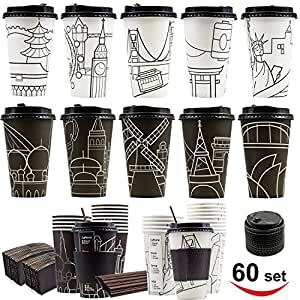 VALUE PACK – 60 pack 16oz (Starbucks Grande Size) disposable hot paper coffee cups. 10 designs, with free travel lids, sleeves and stirrers. Great for hot drink and cold drink; tea, coffee, hot cocoa; family, office, restaurant and party. BEST QUALITY – Made of premium FDA-approved food grade paper and plastics, non-toxic, safe to use everyday. FUN DESIGN – Designed in USA. 10 Cities Skyline, including New York, London, Tokyo, Beijing, San Francisco, Amsterdam, Sydney, Paris, Istanbul, Dubai. Easy to distinguish your cup and adding more party fun. SATISFACTION GUARANTEE – BUY it NOW! If there is any issue that makes you feel unhappy about our product, we promise you a 100% money refund. I just received the cups. Looks awesome, I like it!